Another amazing creation from Paul Santisi. 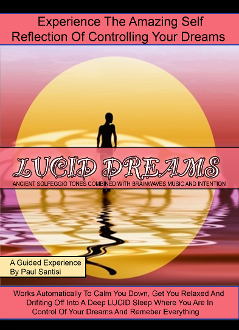 This meditation is a MUST if you evern wanted to or curently lucid dream. This powerful and effective guided meditation will get you dreaming like never before. You will virtually experience stepping into your dreams with 100% awareness and full consciouss thought. Expereince dreams that are vivid, crisp, bright, lifelike and detailed with clarity like you never dreamt before. Get ready to experience sleep at a whole new level of understanding and depth as you are in control of your dreams.